The link below contains a report compiled way back in 1942 for the Rockefeller Institute for Medical Research by Frederick B Bang MD. The subject of the study was SYNERGISTIC ACTION OF HEMOPHILUS INFLUENZAE SUIS AND THE SWINE INFLUENZA VIRUS ON THE CHICK EMBRYO. Now what are we to believe? We have a flu that has somehow changed into Spanish flu causing cytokine storms in healthy patients. How did this happen? We have aeroplanes spraying the affected areas before the new infection suddenly and spectacularly breaks out. What were they spraying? 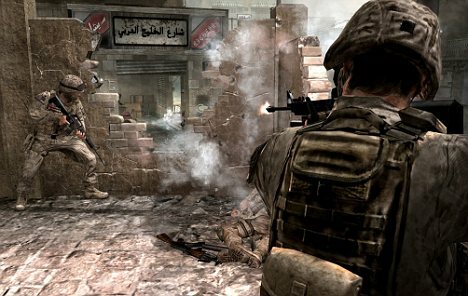 Finally we have a study carried out 67 years ago that established how to create a binary weapon that can be activated by adding a suis bacteria to a swine flu virus. We also have admissions from US research establishments (UC Berkley) that they received military research grants to produce a binary biological weapon. We also know that the Spanish flu virus was back engineered from the Spanish flu victim exhumed in 1997? 1 The Novel A/H1N1 naturally mutated into the 1918 virus? Extremely unlikely. 2 The aeroplanes sprayed a new Spanish flu virus? Unlikely as the virus needs a host. 3 The H1N1 vaccine contained the Spanish flu? Unlikely as the flu vaccine was not widely available and the spread was too spectacular. 5 As above but affecting those who have also caught the virus naturally, hence the lack of availability of vaccines. 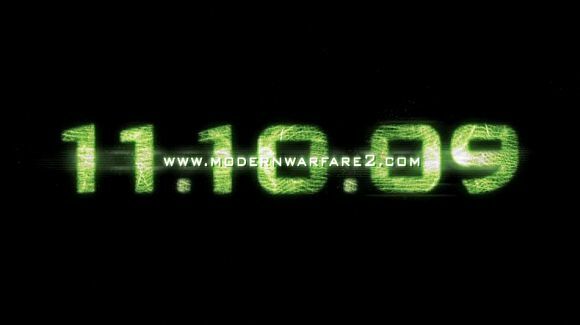 Unknown if this virus remains dormant in people who have had it. Below is a summary of the situation to date on the outbreak, lack of containment and subsequent spread of the pneumonic plague in Ukraine and surrounding countries. This summary highlight the seemingly deliberate errors of the WHO in both containment and diagnosis of the problem, which will for all intents and purposes guarantee the spread of the disease, in much the same way their actions and advice did with the so called swine flu in Mexico back in April. In addition to what Dr Carley said, we also know that the 1918 Spanish flu was exhumed from a corpse in Alaska by a group funded by the Rothschild family through AIPAC and the disease was back engineered at Fort Detrick by Dr Taubenbaur. We can also reasonably presume that a never before seen A/H1N1 virus would NOT recombine with other flu viruses to form a previously existing virus that had been extinct for 90 years. Also that Baxter Pharmaceutical is currently under investigation following the submission of criminal charges in many countries accusing Baxter along with the WHO of attempted genocide. This has caused a flurry of political intervention and the sacking of police attempting to investigate the charges in Austria. Baxter is also implicated in a Bird flu vaccine trial that killed a number of homeless people in Poland who were given the doses as seasonal flu vaccines, the people involved are being investigated for murder. What we are seeing here is a duplication of all the actions that the WHO and the Mass Media used back in the spring, first to hide the existence of the disease and then to ensure it’s spread globally by not containing it. 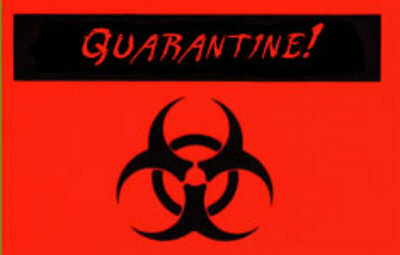 This didease appeared earlier this year in a town in China but was prevented from spreading by quarantining that town until the scare was over. Why are they not repeating this action in Ukraine? It does not seem possible that anyone can read all the facts above and not come to the conclusion that this is a deliberate act. Proof the big corporations are behind this genocide ? The document also describes “quarantines”and operational procedures to be taken upon the official announcements of the “pandemic”by the World Health Organization. IBM’s primary concerns are focused on maintaining their workforce, even under an official quarantine, and the continuation of sales and services to their clients. 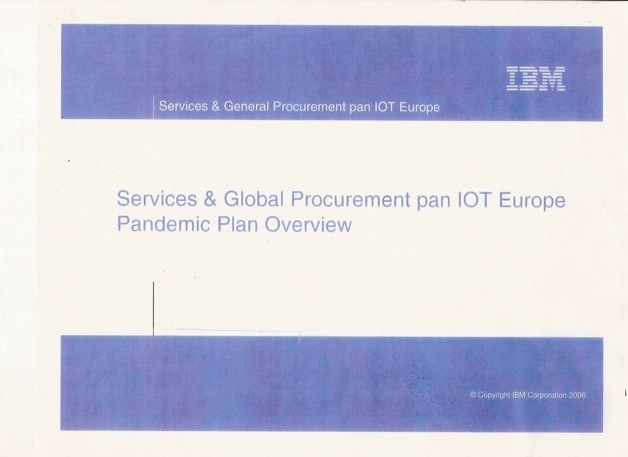 The document has a list of “assumptions” in which it states with a certain dramatic certainty that there will be a pandemic in the next five years following 2006. Perhaps that was an elaboration simply to confirm the importance of the plan? 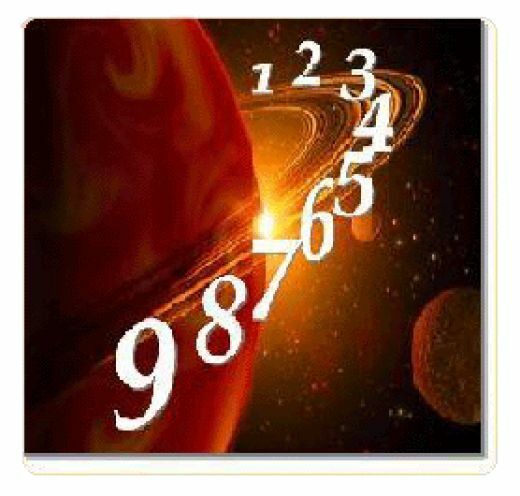 Then it goes on to say that there will be 2 pandemic waves of 12 weeks each with a 12 week gap. That seems a very accurate assumption, but ok let’s just say that these are perameters for a mock up. 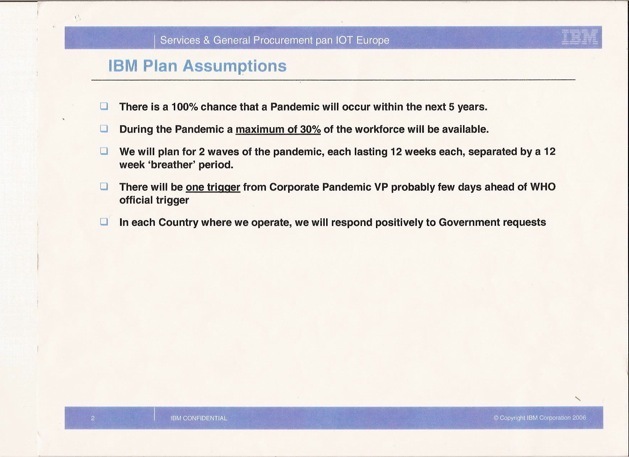 The thing that seems strange however is the statement that IBM’s Corporate VP will trigger the contingency plan “a few days ahead of the WHO official trigger”. How could they do this without inside knowledge? At best from an insider at the WHO, or at worst as an insider in a planned pandemic. 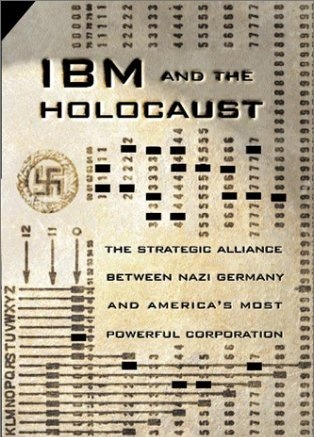 This is no smoking gun alone, but in the context of the full knowledge of IBM’s links with the Global Elite, with the RFID, and with their checkered history during WWII developing the accounting system for the inmates of the concentration camps, perhaps we should err on the side of caution and favour the latter kind of inside knowledge. 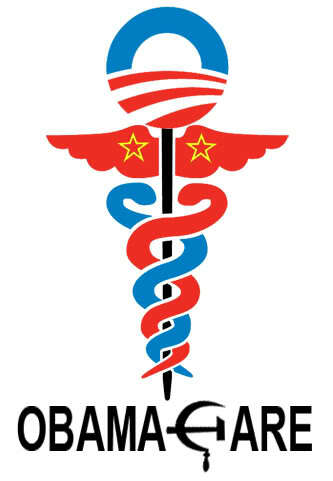 The real reason for Obamacare. . . . . . . . . Mandatory vaccines or NO insurance ! Isn’t it amazing the lengths the elites will go to to force us to poison ourselves with these toxic vaccines. If you look behind the reasons for the whole push for the Obamacare national insurance program you find one very interesting result. The insurance is Mandatory yet the insurers will not be covering you unless you are are vaccinated. Will Fed.Government’s Proposed Mandatory Health Insurance Work? The Government’s proposed mandatory health insurance has been the headline of most news media and on most American’s minds these past months. But, there have been many reports, studies and surveys that show Americans will most likely “not comply” with the mandate of health insurance as reported by the Insurance Research Council. However, under the proposed health reform, those Americans who refuse to purchase health insurance could face monetary penalties. The fines speculated in the health reform bill currently being reviewed by Congress could reach $1,000 for offenders. The Congressional Budget Office has reported that these fines to offenders caught without health insurance could raise billions in dollars over a ten-year period. So it seems there is no escape from this poison. Without insurance you are committing an offense. With it you MUST vaccinate. There is such a push to do this that people must start asking WHY? Why do they desperately want to get these chemicals into us?What is the real purpose of this? What part of us are they trying to inhibit or destroy? These are the questions you should be seeking the answers to. I cannot offer a solution to the Obamacare problem should it go through other than draw a line in the sand right here and don’t let it happen. Below is an article, (reprinted for educational reason) by Dr Tim Ball on the current trend in global temperatures based on REAL data. It seem that the overwhelming ACTUAL data related to climate change as we now call it is proving only one thing. That the planet is is mortal danger of cooling down at a very rapid rate. The data collected since Al Gore’s error ridden film An Inconvenient Truth has shown the opposite to all the predictions he and the IPCC have made. Current Global Temperatures Impossible According to IPCC ‘Science’. But which way is it growing? Which trend are they going to stop? The one predicted by the Intergovernmental Panel on Climate Change (IPCC) or the one Mother Nature is providing? They’ve chosen the IPCC even though all their predictions (scenarios) are wrong. But it is worse. Global temperatures of the last few years are impossible according to the ‘science’ of the (IPCC). 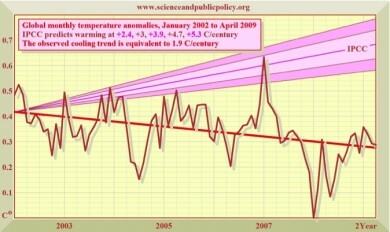 Temperatures were predicted to increase but are declining (Figure 1). Even their lowest scenario says the world should be at least 0.3¬∞C warmer. Doesn’t sound like much but it equals half the warming they claim occurred in the preceding 130 years. Figure 1: Global average temperature 2002 to 2009 and IPCC scenarios. Many people pointed to facts contradicting the “appealing” hypothesis but were ignored or marginalized for several reasons. These included; apparent support from rising global temperatures between 1980 and 1998; evidence too technical for most people; effective personal attacks on skeptics; Gore’s slick propaganda movie An Inconvenient Truth despite 35 scientific errors; and the mainstream media was ignorant of the science and biased. The Medieval Warm Period 1000 years ago was warmer than today. The Holocene Optimum from 3000 to 8000 years ago was warmer than today. The last three Interglacial periods were warmer than the current one. The claim of 0.6 degrees C rise during industrial times was unverifiable because the scientist refused to disclose the evidence and then the government ‘lost’ the data. Four of the warmest years on record in the US were in the 1930s not the 1990s as claimed. 1934 was the warmest in the US not 1998 as claimed. The Goddard Institute of Space Studies (GISS) adjusted historic data down to make the modern record relatively warmer. 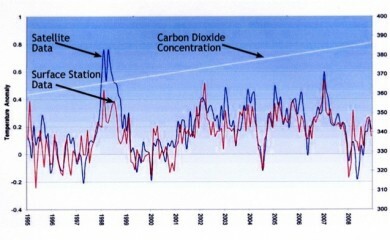 Temperature increases before CO2 in all records. CO2 levels currently at 388 ppm are the lowest in 300 million years. There’s a limit of at most 1.4 degrees C to the amount of temperature can increase even if CO2 doubles or triples. In the 20th century human production of CO2 didn’t fit the temperature record. From 1900 to 1940 human CO2 production levels were low but temperatures increased the most. From 1940 to 1980 human production levels increased the most but temperature declined. The models predicted the atmosphere would warm faster than the surface but the opposite is happening. These are more than enough facts to show the hypothesis is wrong. Polls indicate the public is learning, but AGW proponents and politicians are not and continue to push their political agendas. Now they face facts everyone can grasp. The Earth is cooling with record low temperatures everywhere, a contradiction with the IPCC hypothesis anyone can grasp without scientific understanding. Figure 2 shows 1998 was an unusually warm year attributed to El Nino. 1999 was cooler and AGW proponents correctly said the drop from 1998 was not evidence of a trend. Figure 2: Global temperatures 1985 to 2009 and atmospheric CO2 levels. Temperatures increased slightly again in 2000 (Figure 2) seeming to support the AGW contention. However, since 2002 temperatures declined gradually, making a trend that began in the Southern Hemisphere 10 years earlier global. AGW proponents are now trying to prove the trend doesn’t exist. “Very likely” is defined as greater than 90 percent likelihood. The second statement is also false because they don’t include two of the three known mechanisms of solar causes of temperature change in their models. They did acknowledge, “Difficulties remain in simulating and attributing observed temperature changes at smaller than continental scales” They must say this because they report, “It is likely that there has been significant anthropogenic warming over the past 50 years averaged over each continent (except Antarctica).” If CO2 was causing temperature increase it should be global. So what is happening cannot happen. The hypothesis and the models built on it are wrong. Temperature declining while CO2 increased did force one change; they switched focus from global warming to climate change. Climate Change: What Happens When Nature Disobeys Government. Political leaders say they are going to stop climate change. It is an arrogant, ignorant claim adopted because they accepted IPCC claims and then chose to ignore scientific evidence showing they were wrong. Now they’re ignoring nature, which doesn’t listen as the evidence shows. As Douglass says, “One finds the truth by making a hypothesis and comparing observations with the hypothesis.” The observations don’t support the hypothesis but that doesn’t matter because it fits the political objective. British MP Jeremy Thorpe said “Greater love hath no man than this, that he lay down his friends for his political life.” Our leaders are laying the people down for their political lives. Sadly none of them will ever be held accountable, but the people will pay the price. For the answer we must look at who stands to gain from this plan to implement the “cure” for this non existent problem. The “cure”, apparently, is multi-faceted and includes plans to monitor and tax every carbon creating activity known to man. Also there is a plan to create a carbon credit trade to allow developing countries to sell offsets to developed ones. There doesn’t however seem to be any attempt to cut any of the carbon these people are still blaming for the now non existent problem. With no limits being put on developing countries and developed ones being able to buy offsets to allow them to continue to produce carbon, then what exactly will the carbon trade achieve? This is where you find out who gains. 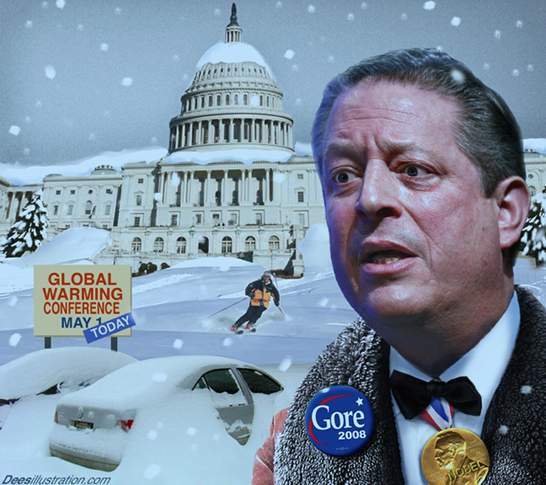 The Carbon credit trade will be run by the very man who is pushing the lie, Al Gore. His company will make billions in trade fees from trading these carbon credits. This is Gore’s pay off for pushing the agenda that will establish a carbon tax that will be paid to the UN run Environmental Government that is about to be created in Copenhagen in December. This carbon tax is the funding the World Government requires to further it’s aims to become a full World Government of the New World Order. The aspect of this “cure” that is uppermost in the aims of the people behind it is the control and tracking aspect of carbon taxing. In order to be taxed, you must be monitored and controlled. The result of monitoring is that your every move, whereabouts and activity will be known to the governments. Total control means the powers that control you can never be removed. It is very simple when you look at the reality behind pushing the lie against all evidence to the contrary. So please realise that nothing these people do happens for your benefit, as you will be the ones paying. Everything they do is for a reason they do not divulge to us, but when you look at the evidence it is so obvious.